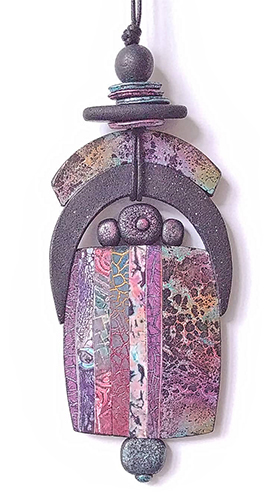 Asian shapes meet polymer stones and colors of Vancouver’s beaches in Janet Bouey’s newest pendant. Janet took some of the surface treatments she learned in a Claire Maunsell class and made the veneers integral to this new design that picks up the colors of the shore. She doesn’t say much about herself but you’ll want to keep track of Janet on Instagram and Flickr.